Work crews have moved derailed train cars upright after a search for victims ended at the crash site in Taiwan. 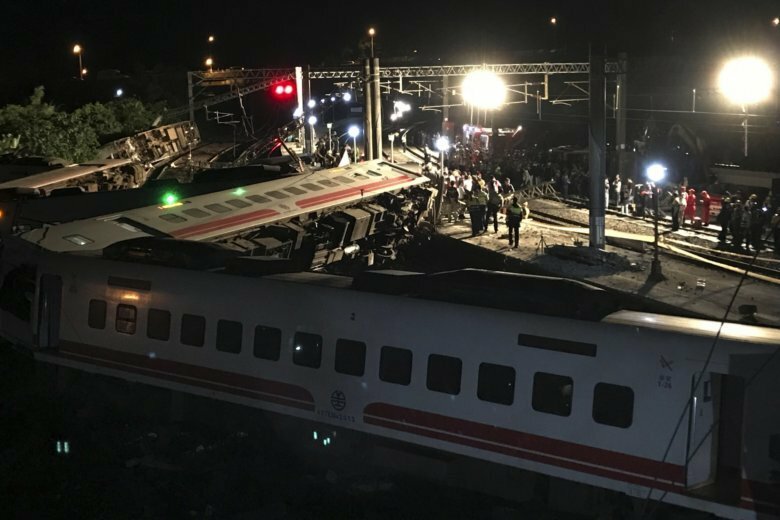 The cause for the derailment of the eight-car Puyuma express train late Sunday afternoon was not immediately known. The Taiwan Railways Administration hasn’t disclosed the speed the train was traveling because it’s part of the investigation. Eighteen people were killed and more than 180 hurt. After searching through the night, rescuers determined there were not more victims trapped in the wreckage and work crews then moved the cars to aid the investigation. The train ran off the tracks as it went around a bend where the maximum speed is 75 kilometers per hour (47 mph). Video showed the train striking and toppling a beam and ripping down metal structures from above the tracks. Rescuers are searching the wreckage after one of Taiwan’s fastest passenger trains derailed on a curve along a popular weekend route, killing at least 18 people and injuring more than 180 others. The Puyuma express ran off the tracks as it went around a bend in the island’s northeast Sunday. It had more than 360 passengers. There was no immediate word on the cause. Survivors told the official Central News Agency the train driver had applied emergency brakes multiple times before the train derailed.